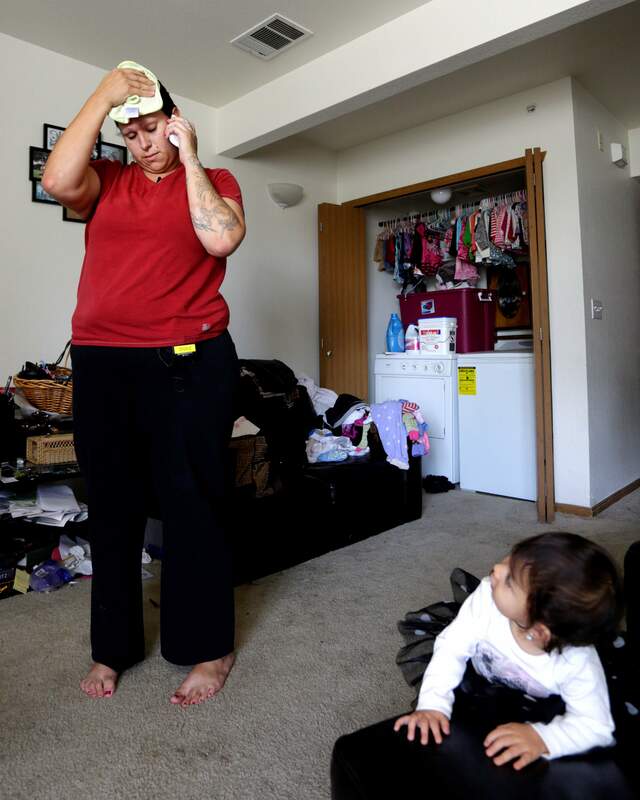 Angel Castro, 28, a single mother with two children, talks to a bus dispatcher to plan her days trips to the store and a doctors appointment with her 17-month-old daughter, Alexis, in their Englewood apartment. Single parenthood is a bigger indicator of poverty than race, according to an analysis of six decades of U.S. Census Bureau data by I-News Network. Combined as it often is with curtailed educational and employment opportunities, the rise of the single-parent family is a major factor in the widening disparities between blacks, Latinos and white state residents in the decades after the civil-rights era. The I-News analysis covered family income, poverty rates, high school and college graduation, and homeownership as reported by the Census Bureau from 1960 to 2010. Health data and justice reports also were examined. While the rate of single parenthood has increased among all races, its surge has been particularly dramatic among blacks. In Colorado, more than 50 percent of black households with young children are headed by a single parent compared to 25 percent of white households. Among Latino households in the state with young children, 35 percent are headed by a single parent, according to the I-News analysis. Regina Huerter, co-founder of the Gang Rescue And Support Project in Denver, which primarily serves Hispanic youths, theorized that the widening divide between the races stems from a mutually reinforcing convergence of births to unwed mothers, growing minority male incarceration rates and the demise of minority neighborhoods. All of these factors weakened the fabric of family life and changed the norms that defined communities just five decades ago, Huerter said. At some point, she said, it became socially acceptable for unmarried women to have babies. When did that happen? What was the date? My mother would have killed me if Id gotten pregnant, said Huerter, who is 52. The states black and Latino incarceration rates are higher than the national averages, where disparities also exist, according to an analysis of Bureau of Justice reports. Nationally, one of every 33 black men and one of every 83 Latino men was behind bars in 2010. Colorados rate for white men was equivalent to the national figure, one in 150. The combination of the war on crack and mandatory sentencing saw a huge sweep of black males into prison and further degeneration of the black family, said Theo Wilson, a district director for BarberShop Talk, a mentorship organization for men. The Rev. Leon Kelly, who has worked with thousands of Denvers at-risk inner-city kids, believes intergenerational abandonment lies at the heart of the single-parenthood phenomenon. I-News is a nonprofit news service serving Colorado.